Cleveland´s Seventh Annual Performance Art Festival was preceeded by an unusual exhibition at the Cleveland Center for Contemporary Art in 1994. Outside the Frame: Performance and the Object was the first major exhibition to examine American Performance Art as it has developed over the past 25 years. Although this endeavour was undoubtedly a breaking of new ground, critics did not treat it leniently. One of them sarcastically claimed that he felt as if he had "encountered dishes in the kitchen sink the morning after a great party". In fact, he referred to Raphael Montanez Ortiz´ piano that the artist had cut into pieces with an axe at the opening on the previous night but the simile might well be extended over the whole project. Just like the pieces of the piano, neither the remnants of the former performances: props, costumes, videotapes, photographic documentations, puppets, writings, and other artifacts, nor the installation created of them are sufficient to convey what had passed with time - the performance - and what was not there - the live presence of the artist. The curators were, of course, aware of this contradiction inherent in the nature of performance, yet, there is more to it. The problem must be treated with irony. "Understanding and acknowledging the significance of this interdisciplinary genre, which is constructed of many contexts", says Olivia Georgia, one of the curators, "depends on acknowledging its ´frame´". Well, this anti-institutional, anti-market, and anti-art form of "art" tries to conceal its frames at any price in order to hide its fundamental complicity with art which it presses against and beyond. 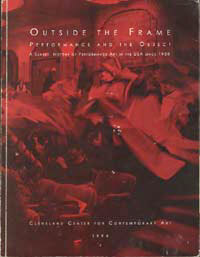 Thus "Outside the Frame" can be read as an ironic title for the exhibition and the catalogue, which was published later. The term "performance" has been in use since the 1970s and refers to a variety of dissimilar works from those presented on traditional proscenium stages, to those in the intimate setting of clubs and cabarets, to public-scale events, to actions that take place in complete privacy and are brought to the public only in the form of a documentation. In the United States, the name is applied retrospectively to happening, Fluxus and other intermedia performances from the 1960s. This variety of artistic expressions, the editors of the volume attempt to convey through a time line of performance and its antecedents, through two intelligent essays, and, of course, through many photographs. And their efforts are quite successful. The book is both informative and a great deal of fun, also, structurally clear. The chronology forms the bulk of the volume, as well as, the art historical frame, which begins with the opening of Le Chat Noir in Paris in 1881 and ends with Orlan´s 1993 performance in New York. The time line is more than a history listed in dates: consisting of the description and, if necessary, the interpretation of performances, original critiques, documents, and photos, it fairly stands on its own. The essays, just like the chronology, unfold the frames of performance from the avant-garde - especially Futurist/Dadaist - art forms, and display its evolution in the light of the new aesthetic endeavours persued by the avant-garde, that is, in the light of the radical transformation of the relationship of the artist, the art object and the audience. While, in the text written by Georgia, the emphasis is on the antecedents of performance, Brentano´s essay accounts for the various types of performance. Among the antecedents, the cabaret, which turned into a mania at the beginning of the century, is of a great importance. Cabaret, this anti-art form composed of poetry, music, song, puppetry, dance, and the visual arts, presented a critical satire of the 19th century aesthetics of traditional high art at a time of a deep crisis. Almost fifty years later performances based on narrative and popular forms, and autobiographical elements renewed its traditions that accumulated in the performances made by a new generation of artists settled in East Village, a slum area of New York in the 1980s. These disillusioned young people coming from all parts of America, populating the Lower East Side clubs, organized euphoric community events, eg. "Real Estate Show", "Times Square Show", in which they openly criticized social and economic matters, money and private property. Studying the history of performance, a course of forty years in the broad sense, women´s increased presence strikes the reader in the eye. Women have seen the medium of the expression of "female creativity" in this genre, as well as, the possibility of establishing a (feminist) community that exceeds race and social conventions. Performance, for female performers, is first of all a tool for the investigation and the transformation of the self. For instance, Eleanor Antin has developed four different alter egos in order to explore several possible roles open to an individual. The adventures of these fictional personae, together with fantasies and autobiographical elements, have constituted an extended narrative which modifies her identity. Other artists have called attention, through these fictive roles, to the stereotype image formed of women and to the multiplicity of contradictory selves required of women in daily life. After all, in the heart of "feminist" performance lies the aim to recreate the model of feminity within a changed social and economic reality and in the light of a 20th century aesthetics which, at last, sees art and life in unity.